Some roads these days are built to be as safe as possible. But back in the day, it seemed like some roads were designed to be as terrifying as humanly possible. Jalopnik readers have found those insanely terrifying roads. What’s The Most Terrifying Road To Drive On? 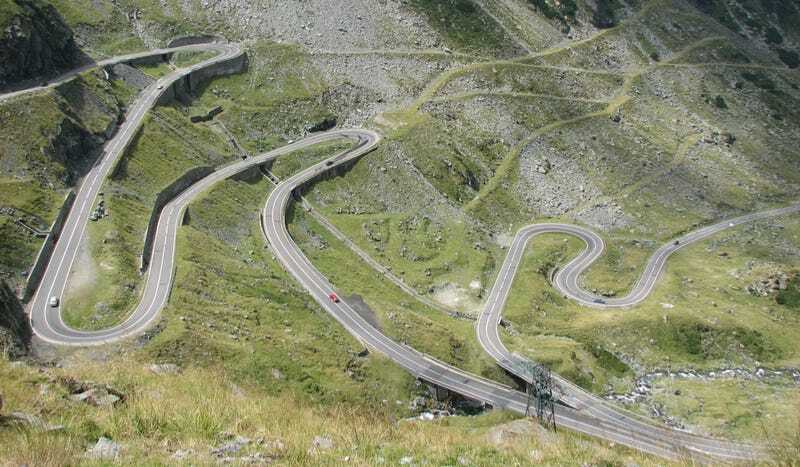 In some cases, terrifying roads, like Romania's Transfagarasan Highway (pictured above), are the best driver's roads in the world. But other times, the roads are an invitation for a driver to die. And in other cases, the road itself might not be super dangerous, but there are extenuating surfaces that make it simply awful. We're talking about inexperienced drivers, inadequate shoulders, or the worst thing, inexperienced and uncaring drivers. Here are the 10 that make us want to call for mommy. There is a show about these roads and the truckers that drive on them. That's how compelling an dangerous they are. One wrong move, and it can spell certain disaster, especially if the ice happens to be over water. Then you have a real issue. It's a road that not even the most talented racing drivers in the road can stay on. Now add in traffic, changing weather, tourists not paying attention, etc. What chance do you have? Not a good one. Route 1&9 from the Lincoln Tunnel to Newark Airport is one of the worst roads in NJ and probably the USA. It's mostly four lanes with a concrete divider and no shoulder. It's curvy, but there are potholes the size of a pregnant adult hippo. And when it gets to a Hudson River crossing, traffic screeches to a halt and people go berserk. The speedlimit is 40 to 50, yet people (myself included) frequently go 70 or faster. The Pulaski Skyway, a huge bridge portion, feels like it's about to fall apart and is super narrow. I once had a former NJ bridge inspector tell me to never drive across it. This road will shake your car to pieces, and if you crash, you're not only going to take out at least six other cars, but you'll also have hundreds, nay, thousands, of irate NJ commuters breathing down your neck. Queens Boulevard, running from just past the Queensboro Plaza N/Q train superstructure to Hillside Avenue. It's a greatest hits collection of anxiety inducers: complex intersections arranged at odd angles, taxis jockeying for turn lanes, freeway ramps, lousy visibility due to elevation changes, multiple service road on/off transitions, a consistently ignored 35 mph speed limit, poor markings, a significant number of the city's elderly of varying ethnic groups trying to cross at any one time (bonus: signs to show which intersections have featured fatal accidents! ), and one of the busiest and clumsiest flows of traffic in the city, if not the world. I am a pretty confident driver, and borderline fearless on my bicycle. Driving on Queens Boulevard gives me the creeps; riding on it is almost enough to make me get off my bike and walk. The Merritt Parkway in Fairfield, Connecticut is a ton of fun. But it's also crazily scary, and here's why. First, the speed limit is relatively low the entire way, but that doesn't stop people from flying by you at 85 MPH. It's curvy, which is awesome. But the standard Connecticut rides, your Range Rovers and Lincoln Navigators, aren't too good around those curves... especially when all the drivers are on cell phones. There is a huge median and nary a shoulder, so if you have an issue with your car, chances are you're going to get someone else involved too. On the best of days, it's hilariously fun. But those days happen practically never. The Red Mountain Pass portion the Million Dollar Hwy, south of Ouray CO. It's 11,000 feet up, fantastic view but don't take your eyes off the road because the crazy hairpin turns, rock face jutting out on one side and straight drop on the other. So if you look at the scenery, you're dead. If you turn too far right, you're dead. If you turn too far left, you're dead. Sounds pleasant. What country gives us dozens of videos each week of something terrible happening on them? Was it Chile? Australia? No, of course not. It's Russia. It seems that a day cannot go by without something insane happening on a Russian road. Tractor trailer making a pass up a hill? Yep. Cars flipping over loose tram lines? Uh huh. You name it, it has happened in Russia. Being on the road near a driver that just got their first license can make you a bit tenuous. You aren't quite sure what they'll do next because they just don't have the experience. So what if you drove in a nation where the car industry has just taken off, roads are springing up like baby rabbits, and everyone is getting their first cars? Welcome to China. It has to be pants shittingly scary, especially in the city centers. Here we have a case where one of the greatest driver's roads in the world is also one of the most terrifying. The hairpin corners beckon you to brake later and later and push harder and harder. But there's a problem: If you brake too late, you're gonna go flying off a cliff. And when you fly off that cliff, you're almost definitely gonna die. It's science. Yungas Road in Bolivia has a nickname that says it all: Death Road. With sheer drops, crazy local cabbies and bus driver, and a loose surface, it is certainly crazy to drive on. The road has also earned its nickname, as 200-300 people are killed on the road yearly. That's nuts. You may remember that the guys from Top Gear traveled this road for their Bolivian special. It was one of the most harrowing on road experiences they've ever had. And there you have it. The most terrifying road... in the world.